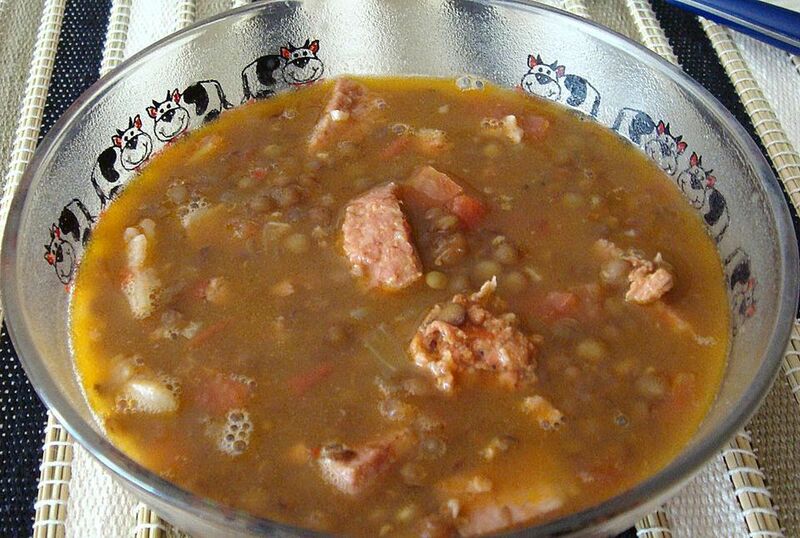 Every family in Spain has its own version of lentil soup (sopa de lentejas). Keeping that in mind, this recipe is one of the most classic ways to prepare it. Use this as a base and, once mastered, feel free to make any changes you'd like to better suite you and your family's tastes. Sopa de lentejas usually is enjoyed as a first course for lunch as many Spaniards consider beans too heavy for dinner. This makes sense since most Spaniards eat dinner late -- between 9 and 11 p.m. This easy-to-make soup is not only tasty but full of nutrients, too. The dry lentils are cooked with diced carrots, celery stalks, potatoes and garlic, and combined with pork loin and Spanish chorizo, a spicy cured sausage, to make a delicious and filling soup. It is typical to eat this soup throughout the winter and even into the season of Lent, by simply omitting the pork meat. The lentils must be soaked for 1 hour before proceeding with the recipe, so plan accordingly. Begin by sorting through the lentils to remove any debris or rocks. Make sure to be thorough, as there is nothing worse than a stone in lentil soup. Then, rinse the dry lentils under cold water. Place the lentils into a medium saucepan and cover with water. Soak the lentils for 1 hour. While the beans are soaking, peel the potatoes and cut them into 1-inch cubes. Trim and peel the carrots and dice them into 1/2-inch cubes. Trim and cut the celery ribs into a medium dice. Peel and mince the garlic cloves. Set the vegetables aside. Cut the pork loin into 1-inch cubes and the chorizo into 1/2-inch chunks. Pour the olive oil into a large pot and heat on medium. When the oil is hot, add the vegetables and cumin and sauté for 3 to 5 minutes. Add the pork cubes and chorizo, and sauté for 3 more minutes, making sure that the meat doesn't stick. Add just enough water to the pot to completely cover the vegetables and meat. Bring the water to a boil. Bring back to the boil, reduce heat and simmer until the lentils are cooked about 1 hour. Check the pot every 15 to 20 minutes. Add additional water if/when needed. When the lentils are fully cooked, season the soup with salt and pepper to taste. Serve in bowls with rustic bread on the side.